We’re excited to announce that version 1.5.3 of the QSun app is available on the App Store and Google Play! 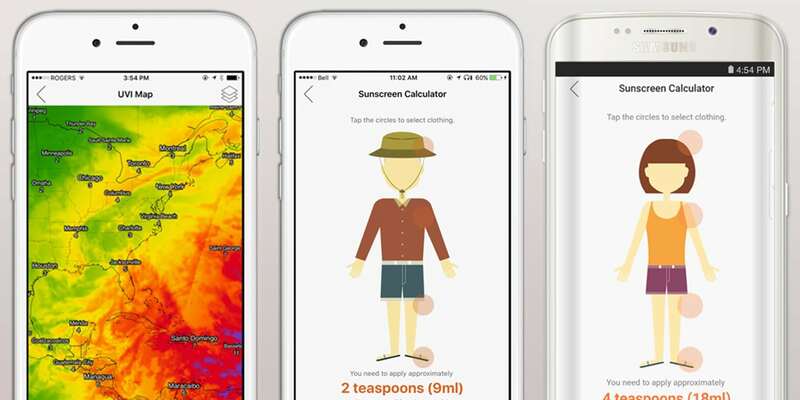 In this app update, we’ve implemented two new and exciting features: the QSun Sunscreen Calculator and Weather Maps. The QSun Sunscreen Calculator tells you how much sunscreen you need to apply to protect your skin from the sun on any given day. The calculation accounts for your skin type, height, weight, and clothing choices. Simply select the Sunscreen icon from the homepage of the QSun app and the Sunscreen Calculator page will open. Select each of the highlighted regions to toggle between clothing options and select the option that best represents your current clothing choice. The amount of sunscreen that you need to apply will appear at the bottom of the page. Try to distribute this amount of sunscreen evenly across all of your exposed skin. To access the Weather Maps, swipe to the Forecast page. Then, select the Map icon at the bottom right of the screen. This feature allows you to view the UV index, temperature, wind speed, sea level pressure, and precipitation forecast for cities on a map. To change between features, select the icon at the top right of the Weather Maps page to toggle between features. You should also notice an improvement in performance as a result of bug fixes and minor improvements in the app. Please download the latest version of the QSun app and let us know what you think!